The LSP 500 Pro offers several different methods for wireless control and connectivity. Offering Wi-Fi for iPad control, Bluetooth streaming from your favorite mobile device or laptop, and optional UHF wireless microphone/multi-unit cascading, the LSP 500 Pro has it all. Wires are so last decade. Everything these days is wireless. The LSP 500 Pro lets you stream your favorite music from any portable device that supports Bluetooth A2DP audio streaming. Simply connect your phone, MP3 player, or laptop to the discoverable Bluetooth connection, and rock out. But hey, not everyone has a Bluetooth device, so the LSP 500 Pro has you covered as well. A USB connection, and RCA line-level connection are available for those devices that still need to be wired. The LSP 500 Pro has a built-in 802.11b/g Wi-Fi transceiver. It can connect to any standard Wi-Fi network in the venue, or one you've brought yourself. 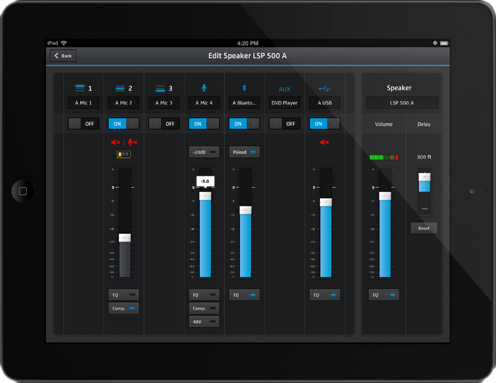 Using the free Remote Control App available for iPad (Android coming soon) you can then control every aspect of the LSP 500 Pro including input and output levels, input naming, battery statuses, and EQ for up to 20 connected LSP 500 units! Control single speakers, groups of speakers, or the whole system all at once. How cool is that? The LSP 500 Pro includes two hot-swappable rechargeable battery packs. Operation is only required from one battery pack at a time so you can swap a dead battery without any break in performance. On average, the LSP 500 Pro can operate for up to 6 hours on a single charge, and it takes approximately 5 hours to recharge the batteries. 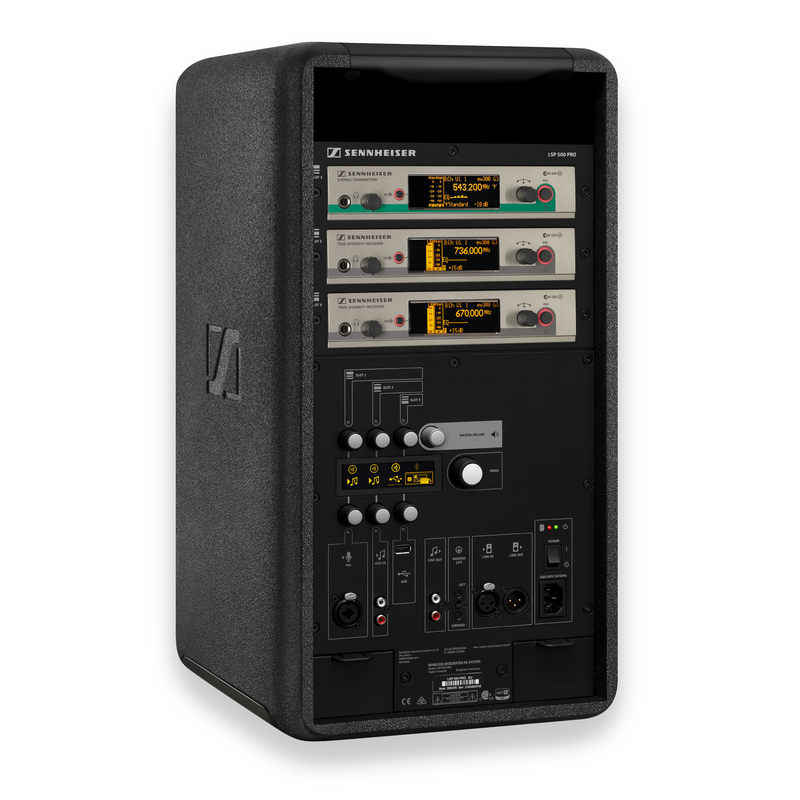 The LSP 500 Pro can be loaded with up to three of the EW series wireless microphone systems to further enhance the system. There are three slots on the back of the speaker to hold EW series receivers. Or, if you want the system to be completely wireless, even between multiple LSP 500 Pro speakers, the first slot can be loaded with the Sennheiser SR 300 IEM G3 transmitter, and the other LSP 500 Pro speakers loaded with one of the EW receivers. Configured this way, the entire system is completely wireless. The speaker with the SR 300 transmitter is the master system that is broadcasting the audio wirelessly to the other speakers in your system, yet you still have individual control of speaker parameters via the iPad app.